Sophomore year. Woohoo. I survived my first year homeschooling a high schooler and learned a lot. This year we are jumping out of the box and making our own choices. Freedom! And it feels amazing. If you are venturing into the high school years I want to encourage you. It’s really not as scary as some think and it’s so rewarding. I pray our selections will inspire you and give you a glimpse into what homeschooling high school can look like. Bible– We are gonna get all crazy and just read the Bible. What a concept! There are about 50 billion awesome Bible studies out there, but my son wants to read his study Bible. So that’s what we are going to do. Specifically, he’s reading through the Old Testament, and he’ll continue to do this independently and tell me what he’s studying. As a family we will be working through Simply Charlotte Mason’s Modern Times, Epistles & Revelation and that will include Bible Study once per week. I’ll explain more about how we do our Charlotte Mason Family Enrichment Loop in another post. Inspirational– For inspiration and part of his Bible credit he’ll read Safely Home. This is an amazing book by Randy Alcorn. The teen years are often are a time where kids turn inward and think mostly about themselves. This book will open eyes to religious persecution in an unforgettable way. I think everyone should read this book. Math– For math we will stick with Teaching Textbooks and my son will finish up Algebra 1 and begin Algebra 2. Many years we struggled with math and it wasn’t until we discovered Teaching Textbooks that he shined in this area. Math is not his favorite subject, but we are advancing and I am thrilled. English– My son wants to become a novelist so he’ll get his chance this year with the One Year Adventure Novel. With this unique English course he will write his first novel over the course of 26 weeks. It’s definitely non-traditional and I think that’s why we are both so excited to begin. Science– We had a long year with science last year so this year we both wanted a course that we couldn’t get behind in. Thankfully we found Classes by Beth Plus. It’s an online class taught by the author of Friendly Chemistry. This man is pumped up about science in a way I never will be. And it includes a lab. I don’t think it can get much better! If you happen to sign up for a course with Classes by Beth please use my name and they will credit me $10 on tuition. (She’ll do it for you too when you refer someone!). Foreign Language– Classes by Beth plus offers many classes so we decided to enroll in Spanish 1, as well. Class is taught by a missionary living in Spain. How incredible. Here’s the book he’s using. History/Geography– I love history especially when studied using living books the Charlotte Mason way. So we’ll be using Simply Charlotte Mason’s Modern Times, Epistles & Revelation. I love the book selections and the pace of this course. Just enough to stir some curiosity but not so much content that my child burns out. My goal is to help my children become life long learners not stuff them with information. I think this course will help accomplish that goal. Physical Education– My son is a sports lover so for Physical Education he’ll be joining his friends at our local Christian Homeschool Athlete Association. It’s an awesome program taught by a great coach. If there is one in your area I highly recommend it. Extra Curricular– After reading about Louis Zamperini last year my son is inspired to run, so this year he’s trying out competitive running. I’m excited to see how he enjoys it. Learn more about our Charlotte Mason Family Enrichment Loop here which all my children will participate in. This is where my high schooler will get some elective credit for fine arts and some literature credit. So be sure to stay tuned! 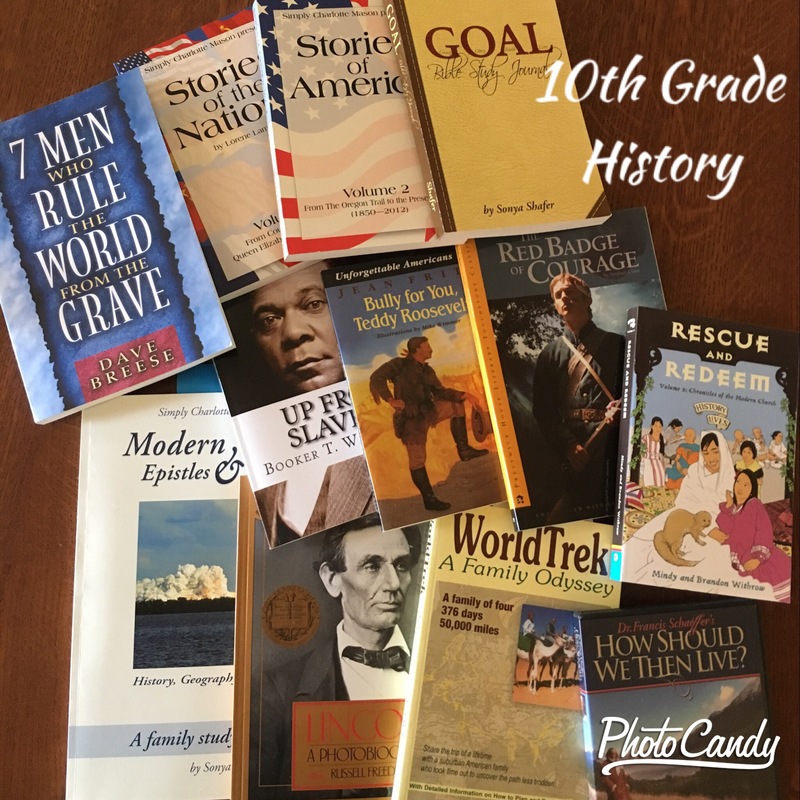 This entry was posted in Curriculum, High School, Homeschooling, Uncategorized and tagged charlotte mason high school, Charlotte Mason Homeschooling, homeschool, homeschool curriculum, homeschool high school, Homeschooling. Bookmark the permalink. So many beautiful choices! I’m going I have to keep these in mind for the future 🙂 I already have my eye on some of these already.